A MARTINI for PRINCE WILLIAM & KATE'S WEDDING! 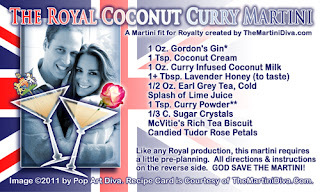 Last week I was contacted on Twitter by several of my followers in the UK and asked if I would create a martini especially for the upcoming Royal Nuptials of Prince William and Kate. I figured why the heck not - it could be fun, right? Then I was asked to put some zip into it to relieve all the dullness surrounding an event steeped in such historic "pomp and circumstance". Little did I know just how difficult it could be to create a cocktail with some English influence that was the antithesis of "dull". 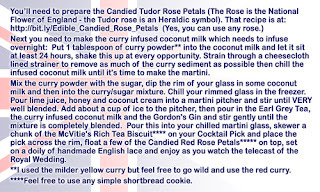 But I did my best and hopefully brought as much classic English influence and flavor to this cocktail as possible. 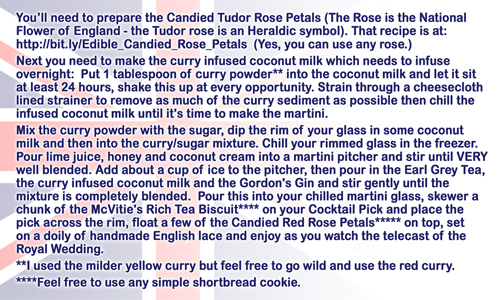 I hope you enjoy my attempt to "curry" favor with the Royal family while I gave my new friends in the UK a fun new cocktail and, hopefully, a giggle or two!